Minor League Baseball may be America’s best kept secret. While most casual sports fans can quickly name several Major League teams (Yankees, Red Sox, Dodgers), the same probably cannot be said about their Minor League counterparts. Yet, as anyone who has ever caught a game at a Minor League ballpark can attest, Minor League Baseball fans are among the best in the world. Indeed: in 2013, Minor League Baseball (MiLB) ranked second in total attendance among all professional American sports leagues with 40 million fans attending games over the course of their season, well ahead of more celebrated leagues like the NBA and NFL. This is the 2014 version of SmartAsset’s study. Read the 2015 version here. In recognition of this most dedicated collection of supporters, SmartAsset took a look at the cities, towns and villages that are home to Minor League Baseball’s 160 teams. We used a data-driven approach to find the cream of the crop: America’s Best Minor League Baseball Towns. Disposable Income – The difference between average income and the average monthly rent for a two bedroom apartment. Team Win Percentage – Determined by each team’s performance during the 2014 regular season. Using these eight factors, we developed two separate scores for each town: a Quality of Life Score, based on the first five factors, and a Team Score, based on the final three. We ranked the towns according to each factor in both of the two groupings, and then applied the two scores, both from 0-100 based on the cumulative total of the two groups of rankings. For example, the town with the lowest cumulative ranking in the first five factors would receive a perfect 100 for Quality of Life, and the town with the highest total would receive a zero. The only exception to that process was our treatment of the “Minor League Class” factor: in that case, we did not rank the teams, but added a fixed score between 0 and 50 to the cumulative ranking for the other two factors included in the Team Score. This was intended to control for the level of competition and the quality of baseball being played, so teams in a higher class were rewarded with a smaller bump to their cumulative ranking—which, in turn, led to a higher overall Team Score for those teams. Finally, to determine America’s Best Minor League Baseball Towns, we combined the Quality of Life Score and the Team Score, giving 80% weight to the former and 20% to the latter. The results, below, are SmartAsset’s 2014 MiLB Index. Coming off their best season in years, Sea Dogs fans are riding high. Their team posted a regular season record of 88-54, good enough to win the Eastern League’s Eastern Division by five games, with over half of those wins coming at home. And just as the team dominated on the diamond in 2014, the town has flourished in recent years. Portland boasts the 16th highest disposable income of the minor league towns we examined, and the 15th lowest unemployment rate. With a Quality of Life Score of 97.47 and a Team Score of 99.37, Portland is the only city on our list to rank in the top 10 in both categories. If there is such thing as a dynasty in Minor League Baseball, the town of Alexandria may have one in the Potomac Nationals. The P-Nats have won three of the past seven Carolina League championships including, most recently, the 2014 title. Baseball isn’t the only thing worth celebrating in the town of Alexandria, however. Just south of Washington, D.C., Alexandria has the highest disposable income and the third lowest unemployment rate out of all Minor League Baseball towns. Find out now: How does my 401k work? Pearl is a relatively new addition to the world of Minor League Baseball; the Braves came to town in 2005, after leaving their previous home of Greenville, South Carolina. Both team and town have adjusted quickly. 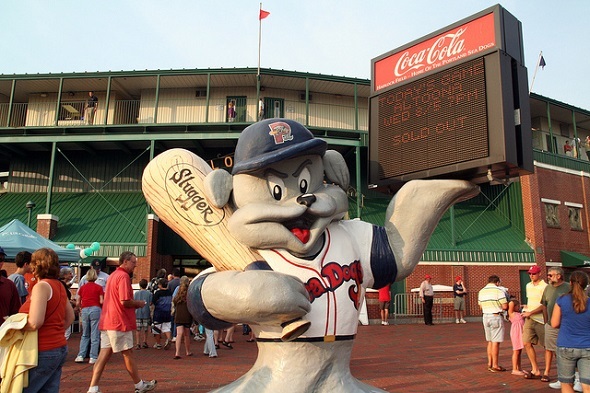 The Braves won the Southern League’s South Division in 2014, with a record of 83-56, and their stadium rated as the fifth best in Minor League Baseball, with the energized atmosphere receiving particular acclaim. And the town itself is, well, a pearl: just across the river from the state capital, Pearl had the 10th lowest violent crime rate among minor league cities, and the 13th lowest unemployment rate. Half an hour north of Dallas, Frisco is a peaceful and rapidly growing community of some 140,000 residents. It features the fourth highest disposable income of all Minor League Baseball towns, and also ranks in the top ten for its low violent crime and property crime rates. Don’t be fooled by those stats, however: when the RoughRiders play, Frisco knows how to make some noise. With a per-game attendance of 6,614 this past season, the RoughRiders had the highest average of any team in the Texas League. The town of Appleton has a long history of professional baseball. Its first team was formed in 1891, when four local businessmen paid $200 to enter a team in the Wisconsin State League. Although that league dissolved at the season’s end, baseball would return again and again to Appleton over the years, finally making a permanent home in 1958, when the Appleton Foxes—forerunner to the present day Timber Rattlers—were founded. And good thing: located in Northern Wisconsin’s Fox Valley, Appleton is a lovely place to live, and a beautiful place to catch some summer baseball. “The Rose of New England,” Norwich sits at the confluence of three rivers in Connecticut’s serene southeast corner. While the Tigers have had mixed results over the past few years, the town is the main attraction. With 90 Dining and Entertainment establishments per 100,000 residents, it had the third highest concentration of such attractions of any Minor League town. For those who would rather be outdoors, 380 acre Mohegan park has hiking trails, a Rose Garden and, if you’re so inclined, ample open space to gather some friends for an old fashioned game of stick-ball. About halfway between Baltimore and Washington D.C., Bowie is something of an oasis between the two metropolises. With under 150 violent crimes per 100,000 residents, it has the 12th lowest violent crime rate of any minor league town, to go along with the 4th lowest property crime rate. Although the team has yet to win a championship in its 21-year history, the atmosphere at Prince George’s stadium still receives high praise. Round Rock’s motto is “The Sports Capital of Texas,” and at least one prominent sports family appears to agree with the sentiment: Hall-of-Fame pitcher Nolan Ryan and his son Reid are co-owners of the Express, having moved the team to Round Rock in 2005. With an average attendance of 8,390 per game, the Express drew some of the largest crowds of any Minor League baseball team in America in 2014. This may be due to the close proximity of Austin, Texas, the largest city in the U.S. to lack a major professional sports team. The only West Coast town to make the top ten, Hillsboro offers its own distinctive taste on Minor League Baseball. Take the team mascot for example: the “Hops” aren’t jumpers; they’re the key ingredient in everyone’s favorite game-day beverage. While the source of the name stems from the team’s original hometown of Yakima, Washington (which supplies some 70% of all domestic hops), Hillsboro has adopted the idea with gusto. The team now has its own specialty beer, brewed by the team sponsor, Bridgeport Brewing Company, specifically for consumption at the home ballpark. Perhaps more than any team on this list, Midland epitomizes what Minor League Baseball is all about. The stadium atmosphere is terrific, ranked 6th out of all 160 Minor League ballparks. The town of Midland, located about 20 miles from Lake Huron in central Michigan, is the safest on our list: it had the lowest violent crime rate and the fourth lowest property crime rate. It almost doesn’t matter when the team isn’t playing well; in Midland, there’s no better way to spend a summer afternoon than to enjoy a Loons game at the ballpark. In all, the geographic distribution of the towns that made the top 25 is quite evenly spread across the country. No state has more than three top 25 towns, and 19 different states make an appearance. There is perhaps one exception: the West Coast is somewhat underrepresented, with only three teams in the top 25—and that’s including Boise, Idaho. Texas and Virginia appear to be the ultimate Minor League Baseball states, with three towns a piece in the top 25. 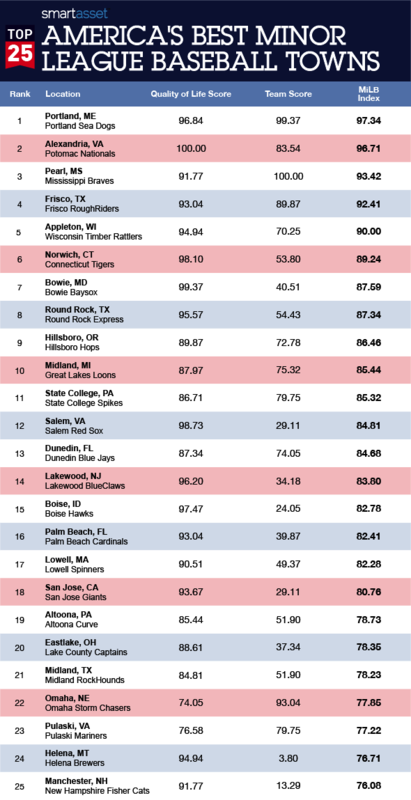 Read the 2015 version of SmartAsset’s study of America’s Best Minor League Baseball Towns here. 1. We excluded the teams and towns in the Mexican league, as well as Vancouver Canada. We also did not consider the rookie leagues that play in spring-training ballparks in Florida and Arizona. 2. Data on violent crime and property crime rates came from the FBI’s Uniform Crime Reporting database. Data on the unemployment rate came from the Bureau of Labor Statistics. Data on per capita income came from the U.S. Census Bureau, as did data on the number of dining and entertainment establishments per capita. Data on average rent came from the Department of Housing and Urban Development. 3. The ranking was done in 2013. Since the El Paso Chihuahuas began playing in a brand new stadium this year, which was not included in the stadium rankings, we gave them an average ranking overall. 4. A quick primer on the structure of Minor League Baseball: the subdivisions in MiLB are called “classes” and there is a general hierarchy based on the proximity of the players in each class to the Major Leagues. It goes as follows: Triple-A is highest (that is, closest to the majors), followed by Double-A, Class A Advanced, Class A, Class A Short, and Rookie. The further up that ladder you climb, the higher quality players and teams you will find, for the most part.